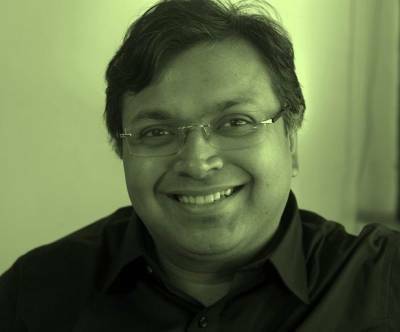 It is a herculean task to relate Indian mythology with the current scenario but renowned author Devdutt Pattanaik has undertaken this as a challenge. His understanding of the subject, the research he has conducted and by virtue of authoring innumerable books on Indian mythology and relating their significance to modern day life, he has been the apt choice for Siddharth Kumar Tewary’s Mahabharat that begins on Star Plus on September 16th at 8.30pm. He is all set to make his TV debut although off screen and has been selected as Chief Consultant for this new project. In his view all incidents that occur today have a parallel to the epic and hopes that the younger generation will relate to the series. The various books he has written related to Hindu mythology, include Myth- Mithya, Shiva –An introduction, Indian mythology, Jaya: An Illustrated Retelling of the Mahabharat, The Pregnant King among others. With Pattanaik’s rich understanding of mythologies and having worked closely on this genre, Adgully, in an exclusive conversation gained insights on the upcoming show Mahabharat and also how challenging it is to fit Indian mythology in today's scenario. Star Plus as a channel believes in retaining the bond with audiences and keeping them engaged with new and fresh ideas. Although different mythological series are popular with viewers on different channels in different time bands we asked Pattanaik, what is new about this series of Mahabharat that will grab eyeballs. He said, "I have not seen the other shows on other channels. In this retelling, we have tried to satisfy the diverse television audience by showing the human side of all characters, how noble and how unwise they could be. This coupled with spectacular sets and special FX will surely stir a lot of curiosity." When any show goes live on screen, it deals with a challenge of adapting to present day scenario. So, even to relate Indian mythology with the current day scenario is the biggest challenge. We asked him to explain how it is possible to draw a parallel between the two, on which he shared, "Mythology is timeless. People in the show may wear costumes of the past but the issues they are dealing with are timeless and will be relevant in the past, present and future. They are issues like ambition, greed, love and jealousy." With regard to research carried out by him for the series and in what way it will contribute to the show Pattanaik shared to say, "There is a team of researchers. I have written a book called Jaya - an illustrated retelling of the Mahabharata by Penguin India for which I had done a lot of research. The idea was to talk about stories not just from the classical version but also from various regional versions and folk traditions to give richer and fuller experience to the audience." In recent times it has become a trend whereby we see most channels on Indian television focusing on different mythological content. On asking how he sees this genre growing in India, he avers, "I am not an expert on this. You have to ask TV experts. Indians have always loved mythology. Maybe, television is finally realizing this." Where casting for Mahabharat is concerned the younger generation has been roped in. Is he satisfied with the casts and the way in which the storyline has been projected in the show? "I am not involved in the casting process or storyline. Mahabharat can be told in various ways and this is yet another way. Each way is delightful and has something new to offer," he reverted. Pattanaik shared the two major elements which will help this version of Mahabharat to build better connectivity with the audience. He said, "One, it shows the characters as humans with human frailties that audiences will be able to connect with. Two, it has sets and costumes that are grander than ever before." As Chief Consultant of the show and making TV debut off screen, we asked him, how he plans to present a style that is unique and different from standard visual formats that are prevalent of late. "Well, I am advisor to "Devon ke Dev Mahadev" which has been running on Life OK for past one year. So this is not my debut. I am a consultant, I consult. The rest is up to the production team," concluded Pattanaik. Star Plus to air Mahabharat in a film format! Results out; Star Plus' Mahabharat an epic winner...! With scale, innovation and impact Mahabharat on Star Plus says it all! Can today's Radio bring back the magic of Binaca Geetmala! How the popularity of Bigg Boss surged in India over the years!